While the primary purposes of the Kwantlen Public Interest Research Group’s annual general meeting were for the society to review their year, vote in new board members, and update members on future plans, questions relating to recent fraud allegations against founder and former administrative coordinator Richard Hossein dominated the meeting. The AGM, held in the Surrey conference centre on March 28, opened with a small concert by JB the First Lady, an Indigenous spoken-word and hip-hop artist. Voting and registration took place in the back of the room during the performance. Directors Simon Massey, Jagdeep Mangat, and Raqiya Khan were present to discuss KPIRG’s previous and upcoming years. Massey opened with an acknowledgement of territories before walking those in attendance through many of the events that KPIRG has hosted throughout the past year. Some highlights included the Refuge in Surrey panel, Dis/Orientation week, Mixolos Mitchtape Live, and a series of events held for Black History Month. Massey also spoke about KPIRG’s campaign to secure office space on campus, noting that, due to turnovers, events, and a generally busy year, it hasn’t been the organization’s highest priority. The meeting’s focus, however, quickly turned towards KPIRG’s budget. While the audit conducted by Manning Elliott LLP indicated good financial health, in part due to KPIRG being reliably funded through a levy off of the student body, questions from the audience were asked for nearly 45 minutes about the “non-operational loss” of approximately $112,000. Massey clarified at the beginning of this question period that, due to the ongoing civil claim, they would need to be careful with how they answered questions. Mangat directed members to read the notice of civil claim posted on the KPIRG website for more information about the ongoing legal case. Although Mangat is a lawyer, he has made clear that he doesn’t represent KPIRG in a consular manner. “Certain things are going to clarify themselves in the time that’s coming, but we found it incumbent to take legal action as soon as possible,” he said. Massey and Mangat have stated that a special general meeting will be held upon completion of the forensic audit, and that they will provide updates as necessary. Massey has also said that the forensic audit will cover KPIRG’s entire operational history, not just the previous year. One member in attendance at the AGM asked the directors about which internal controls KPIRG has and which ones failed. He also said that any financial risk wouldn’t be in regards to the money coming in, but money going out of KPIRG. Massey suggested that before he was at KPIRG last year, many board members and staff had signing authority, but he wasn’t able to elaborate on who signed specific cheques, citing liability and legal advice. Tanvir Singh, who clarified that he was at the meeting as a student and not in his capacity as president of the Kwantlen Student Association, moved a motion that the meeting go in-camera to discuss in further detail, though the motion failed. After this, Mangat emphasized that more details would materialize as investigations take place, and that the staff present for the lost funds are no longer with the organization, or were asked to resign by the current board. Currently, at least one director needs to sign each cheque, and a single cheque can not be signed only by two staff members. When the discussion finally led to a vote, the motion to adopt the audited financial statements failed to pass, with only four votes in favour and no votes against. A minimum of 15 votes, with most of those being in the affirmative, was needed for the motion to be successful. 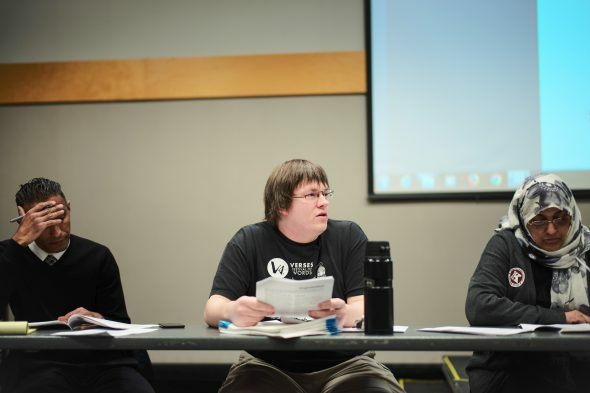 “I believe, according to the Societies Act, KPIRG bylaws, and the KPIRG-KSA autonomy agreement, the membership not accepting the audited financial statements—while still a significant action—will not prevent KPIRG from continuing its operations and its social and environmental justice work,” says Massey. As of March 29, Massey and Mangat were re-elected as board members, with Yasmin Ullah also being voted in. Raqiya Khan did not run for re-election. According to Massey, KPIRG will be looking into whether it’s appropriate to put the same financial statements to vote at their next general meeting.